It would have made more sense for me to compile this list before the holidays, but there are always birthdays, weddings, and housewarming parties that demand some type of gift. Obviously, the ones I would choose for this blog are Philly-centric. More importantly, all of the items are Philly-made as well. Mama May I toys and games are made by Jessica in South Philly. This memory game and others can be found on Etsy and online. You can also follow her on Facebook. Inspired by a post from My Modern Metropolis (an incredible blog if you haven’t yet seen it) and a trip to the Park Ave Armory in Manhattan for Ann Hamilton’s the Event of a Thread (see below), I thought I would look back on some of Philly’s interactive art installations of 2012. This installation featured seven trippy large-scale outdoor light installations. My favorite was the Forest of Light featuring 20,000 illuminated stems that looked like blooming flowers amidst a dense forest. The other most striking part of the installation was the Water Towers, a collection of 69 symmetric towers made of two-liter soda bottles. Each bottle contained a fiber optic cable that changed color in relation to music that was being played throughout the installation. I don’t know what Longwood Gardens could do to top that installation. Philly has no shortage of great city-centric blogs. Some of my favorites are the style blogs, which maybe, just maybe, are helping me hone my fashion sense a bit. I wanted to give a highlight of those that have made it into my Google Reader and which I now read religiously. 1. 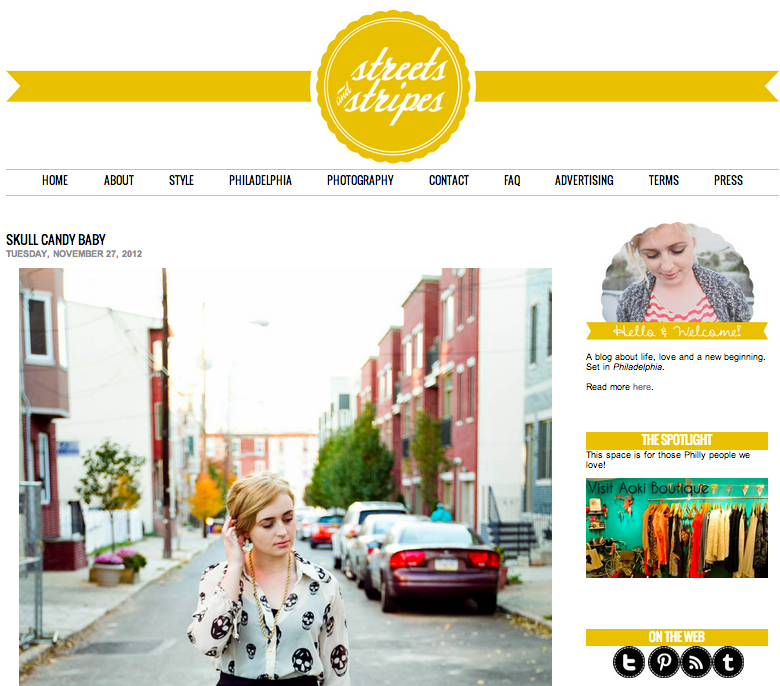 Streets and Stripes: A fashion and lifestyle blog authored by freelance photographer and editor Chaucee Stillman that’s geared towards young, creative, and culturally aware readers. Lots of photos of Chaucee’s great personal style, other beautiful Philadelphians, and photo shoots in some of the city’s lovely boutiques.